The delusional psychopath running Venezuela into the ground is so enamored with the sound of his own voice he's releasing an album with a collections of songs and poems. A great little stocking-stuffer for the Marxist revolutionary in your life. Designed for "militants, supporters and friends" of the PSUV, the selection of 18 songs also includes excerpts from a speech by Chavez laid over a well known campaign melody. It was a tune that was also used for the campaign on the referendum on constitutional reform that Chavez's government narrowly lost last December. "The revolution is happiness, it's music. We wanted to make a disc to take the happiness of this electoral party to the streets," said Gustavo Arreaza, the musician and producer in charge of the project. The album was recorded by artists and groups "engaged with the Bolivarian Revolution." 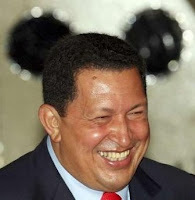 It is not unknown for Chavez to burst suddenly into song during his televised speeches, and although he often claims he sings "very badly," one presidential aide last year went so far as to compile his greatest hits from various political speeches. Listening to the song, Venezuelan musician Carlos Rosales said he felt that "el comandante" had "everything that you need to sing our folk music: creativity and an ideal for which to sing." He added that in order to sing this kind of music the most important thing is "to sing with passion, and we can't deny that when Mr Chavez speaks, both his supporters and opponents alike feel that he really means what he says." Meanwhile, leftist intellectuals (now there's an oxymoron) are flocking to the new hotbed of radical thought: Caracas. Maybe it'll become the new Berkeley. The Nepalese Maoist smiled as he glanced around the lobby of the Hotel Alba Caracas. To his left, West African delegates to the World Meeting of Intellectuals and Artists in Defense of Humanity chatted in French. To his right, the Egyptian author of a book on President Hugo Chávez puffed on a cigarette. “This has been a most enjoyable forum, allowing us to learn from the glorious heritage of socialist revolution in Latin America,” said the Maoist, Chandra Prasad Gajurel, 60, a Politburo member of the Communist Party of Nepal, which put an end to that country’s monarchy in elections this year. Mr. Gajurel joined some 200 other leftist thinkers from around the world who convened here for a few days in October to discuss transitions toward socialism, even as many people in advanced Western countries were losing sleep over the spreading financial crisis of global capitalism. What a glorious time it must have been.